Distinguish fake Brazilian hair and real Brazilian hair? 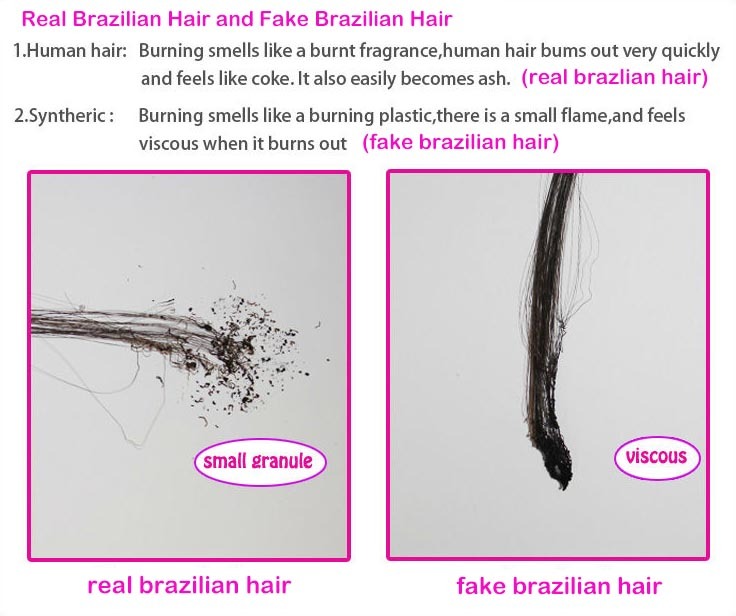 Home Blog | News Human Hair News Distinguish fake Brazilian hair and real Brazilian hair? Hair extension is the ladies used to decorate their props, dear ladies,you know how to distinguish real brazilian hair? 1. You can first determine whether you buy the Brazilian hair is a true virgin remy hair color, virgin Brazil hair color from natural black to brown, but in most cases, it is medium brown # B hair; the other hand Trimmed hair can not be uniform because there is natural light in primary colors. 2. Judge whether the hair you buy is really remy hair, the virgin Brazilian remy hair will not be very straight or silky, usually it is relatively rough, not the original hair is usually processed using various chemical products. 3. You can try the flame test. Cut off your purchase of a small piece of hair as a sample, and put it directly on a small flame, through the chemical processing of synthetic hair is very flammable, and will produce a large flame, while the real virgin hair is relatively thin And will not be highly flammable, when it comes in contact with the flame usually produces smoke, but will not be a huge flame. 4. If it is not a real virgin hair, wet water will be heavy, the hair will fade, and the real virgin wet hair after the wave and curl remains prototype. Do you know how to getting the real brazilian hair?of course kabeilu,kabeilu hair company always insist to producing virgin hair extension,providing customer cheap brazilian hair.